Time to get prepared for HP Discover at the Venetian in Las Vegas. This year I will hang around again for 6 days in Sin City, the city that never sleeps and also the place where all the things that happen over there stay there as well. Every year at the end of the week I felt like I did not have enough time to do all the things I needed to do. That’s why I make myself this little list. I will arrive on Saturday evening since I am a teacher again for HP ExpertOne who are organizing several free HP classes. I will host the Master ASE Storage class again (sorry fully booked and some people on the waiting list, remains a popular class!) for 2 days. Once the event begins on Tuesday I am invited again by my good friend @HPStorageGuy aka Calvin Zito to attend the famous Coffeetalk sessions as a blogger. So I will keep you up2date live from the Discover floor on all announcements. So keep following your favorite blog 😉 for the latest news on HP 3PAR, HP StoreVirtual, HP OneView, HP ConvergedSystems, Appolo, Proliant and many other cool stuff… If all the rumours are true that I heard the last months it can become in interesting week! In a silent moment I will try also to pass some (free!) HP ExpertOne exams at the PearsonVue center onsite, hang out at the ExpertOne lounge, attend the General sessions, check out the CDA booth for all the things I will not be allowed to talk about for the upcoming months (but always cool to know in advance what HP is working on), check out the booths, meet Storage and OneView managers and a lot of other networking with HP people and partners! It will be the moment as well to hang out with peer trainers, most of the ComputerData team, proud to be part of this group of the best HP trainers worldwide! For those who are coming and want to say hi and hang out with me, just ping me via Mail, Twitter or Skype. Or check out the ExportOne training floor on Sunday and Monday, and the bloggers lounge the other days. Be social and share, hope to see you there! 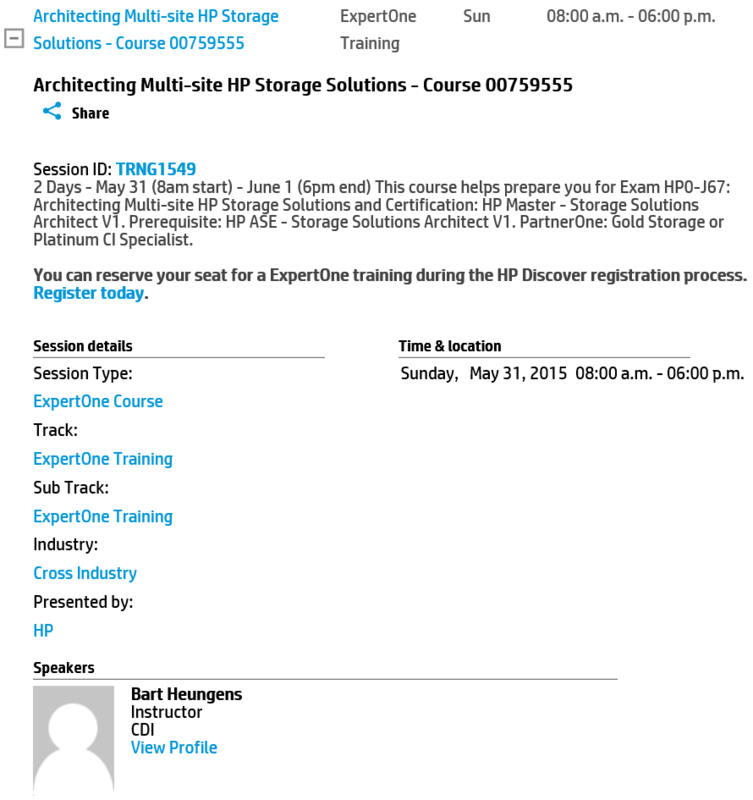 PreviousNew HP ExpertOne certification launched : become OneView certified!